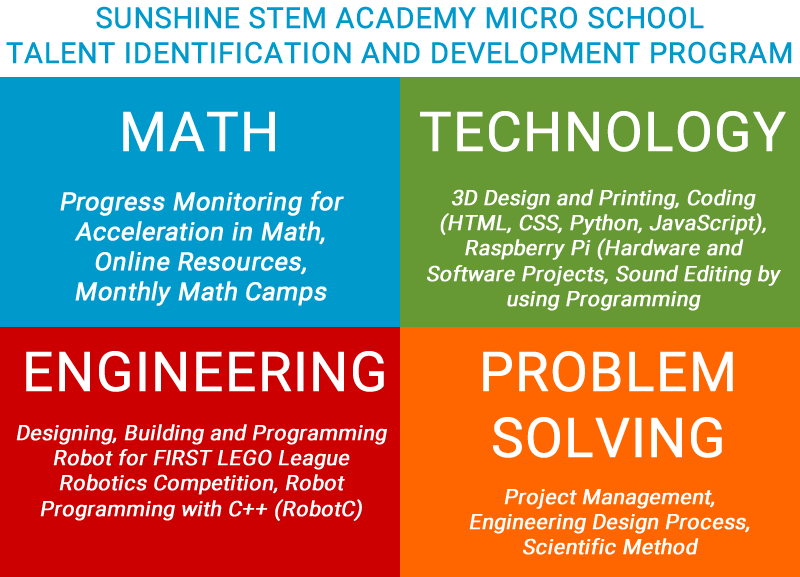 In order to identify and develop kids’ talents in technology and engineering, Sunshine STEM Academy Micro School offers Talent Identification and Development Program. Please scroll down to see yearly calendar of activities. 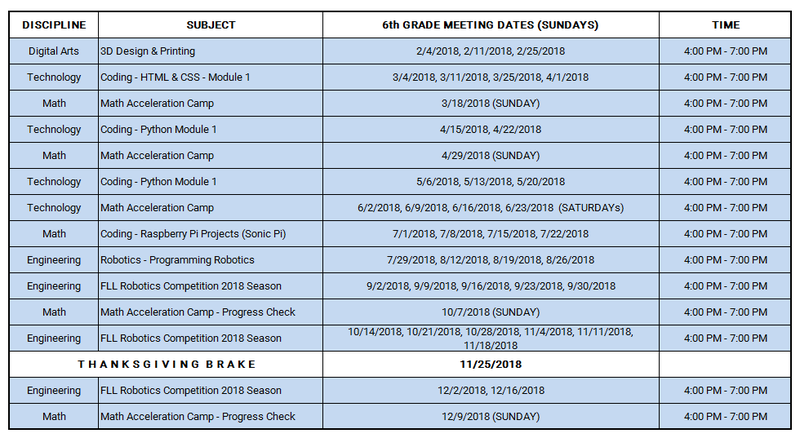 Math Camp dates are subject to change based on the decision of instructor, and parents of students in each team. Students will be meeting total of 123 hours in this program. 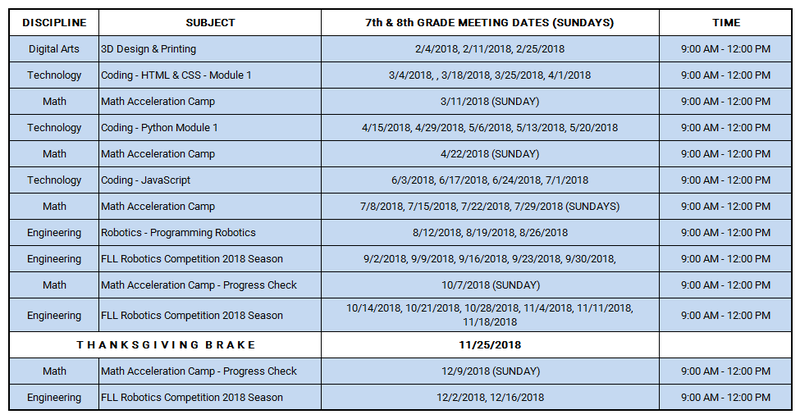 As a team, if students qualify for Super-Regional and/or State Level FLL Robotics Competitions, students will be keep meeting weekly basis. Number of team members for each grade level is limited to 6 students. Once team reaches 6 enrollments, no more students will be enrolled to team, and team will continue activities throughout the year. 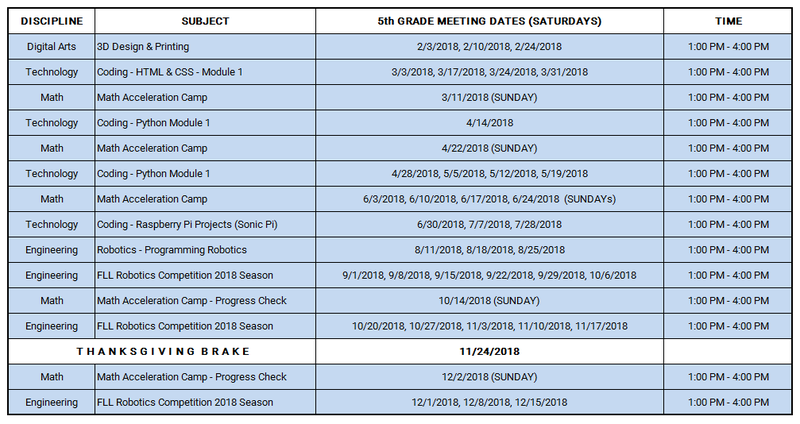 Enrollment priority will be given to students who have received services by Sunshine STEM Academy Micro School first. Spots will be filled first-come-first served basis. If there will be open spot by February 15th, program will be announced to public to fill the spots. Why STEM Education is Important? STEM education creates critical thinkers, increases science and technology literacy, and enables the next generation of innovators. Innovation leads to new products and processes that sustain the economy. This innovation and science literacy depends on a solid knowledge base in the STEM areas. National Science Foundation states that in the 21st century, scientific and technological innovations have become increasingly important as we face the benefits and challenges of both globalization and a knowledge-based economy. To succeed in this new information-based and highly technological society, students need to develop their capabilities in STEM to levels much beyond what was considered acceptable in the past. 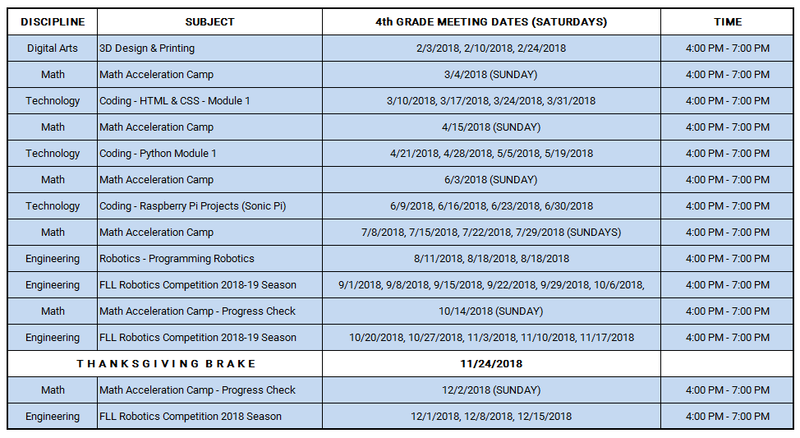 *Math Camp dates are subject to change based on the decision of instructor, and parents of students in each team.